The problem of Configuration Management is a problem no longer confined only to Network Equipment Providers. As the Internet of Things (IoT) expands exponentially around us, the need for standardized network configuration methods becomes ever more apparent. 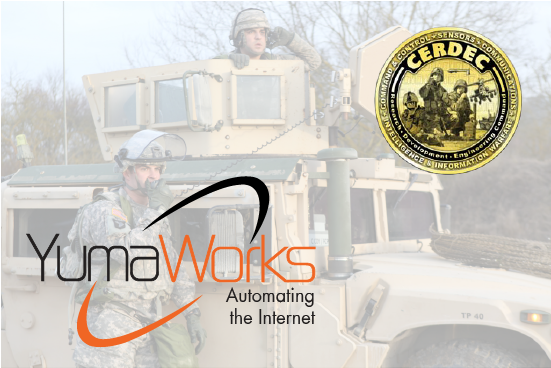 The U.S. Army recognizes this growing need, and has tasked YumaWorks, a recognized leader in driving and implementing network configuration standards, with solving the problem of automating tactical network configuration through a Small Business Investment Research (SBIR) Project. Tactical networks are critical to soldiers’ ability to communicate and access applications. The configuration and operation of network devices needs to be simple, fast, and reliable. You would be hard-pressed to find another configuration management problem with stakes as high as they are in a tactical network. The emerging NETCONF standard protocol can be optimized to meet the special needs of tactical networks. The goal of YumaWorks’ research is to identify the specific gaps in the NETCONF protocol and architecture that limit its usefulness in tactical networks, explore a limited number of solution paths, and recommend a solution approach to close the gaps. Major improvements in transaction resiliency in slow and/or unstable network conditions can be achieved. Enhanced NETCONF and YANG can be used together to provide a solution platform for scalable configuration management performance in low-bandwidth networks with lots of NETCONF servers to manage. The NETCONF security model and server architecture can be enhanced to allow any component (e.g., identity management, user authentication, role-based access control) to be configurable and independent of the NETCONF server. This month marks the completion of the first year of the Tactical Network Configuration SBIR project, and YumaWorks is proud to announce that we have made great progress in solving the multidimensional problem of configuring tactical networks in standardized, efficient, and reliable ways. There is still much to accomplish, however, and YumaWorks is looking forward to the challenges ahead.